Helpless But Not Hopeless is the second release by Oxnard, California based band The WAY. This powerful album includes seven songs that blend their classic punk sound with an ounce of the blues and metal tinged riffs. The WAY’s music brings the Truth and the Life to everyday problems, discouraging situations, and questions about who we are. 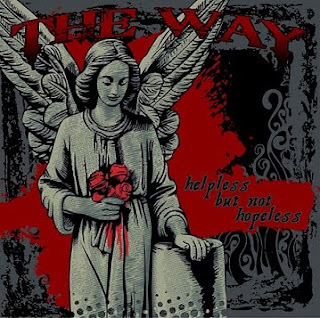 Addressing life’s gritty realities through the lens of Faith, Forgiveness and Hope, The WAY delivers an uplifting message through music influenced by Social Distortion, Rise Against and Pennywise. Helpless But Not Hopeless is available for pre-order through the Thumper Punk Records website, and will be available for digital download at all the usual places in the near future. Their song “Don’t Let It Die” appeared on the Indie Vision Music compilation called Punk Never Dies, Volume 1. Additional information about The Way can be found at http://www.myspace.comtheway805 and http://www.reverbnation.com/theway805. Additional information about Thumper Punk Records and a link to its webstore can be found at www.thumperpunkrecords.com. CD pre-orders are $7 for shipments December 15. One Response to "The WAY – Helpless But Not Hopeless available for pre-order"